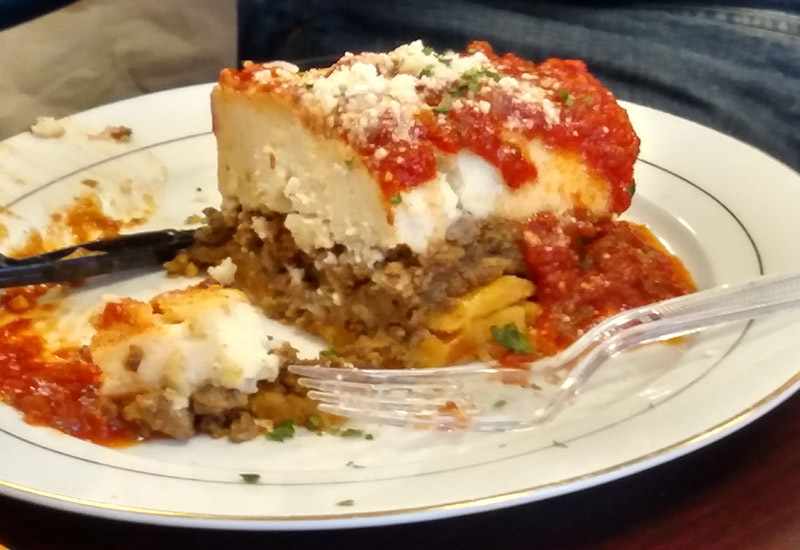 Cary, NC – Across Cary and the Research Triangle, there are many different Mediterranean restaurants reflecting a variety of countries and cultures. So to stand out, Cary’s new Nile Café and Bakery is working to be different and offer Egyptian food customers cannot find around town. Ehab Hassan and his wife opened Nile Café in September 2016 after years of cooking and catering for their friends and for non-profit events. “From there, people saw all our recipes and thought we were unique,” Hassan said. One way Hassan’s cooking is different is he brings in styles and recipes from Egypt with dishes such as koshari and kufta beef with their own mix of spices and lentils. 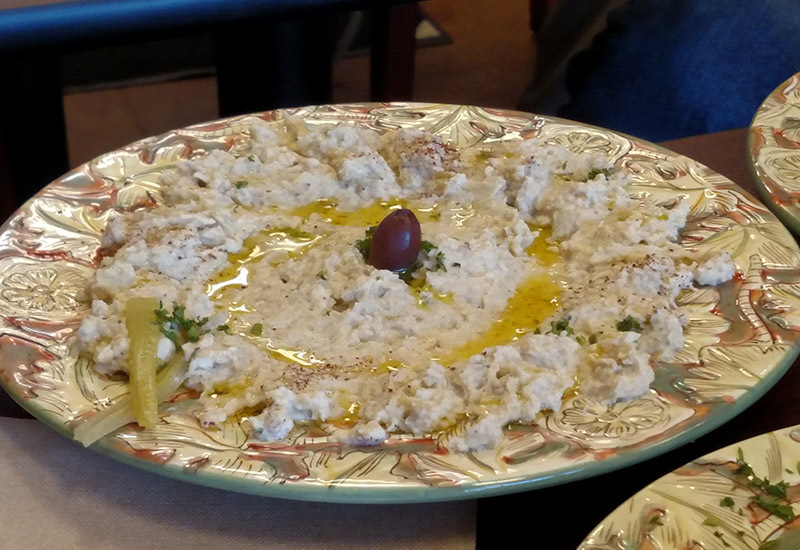 Another difference between Nile Café and many other restaurants is Hassan’s commitment to have as many fresh and made-from-scratch foods as possible, from hummus and grape leaves made in the store to their own fresh cream for their many desserts. “We make daily quantities so we can serve fresh every day,” he said. 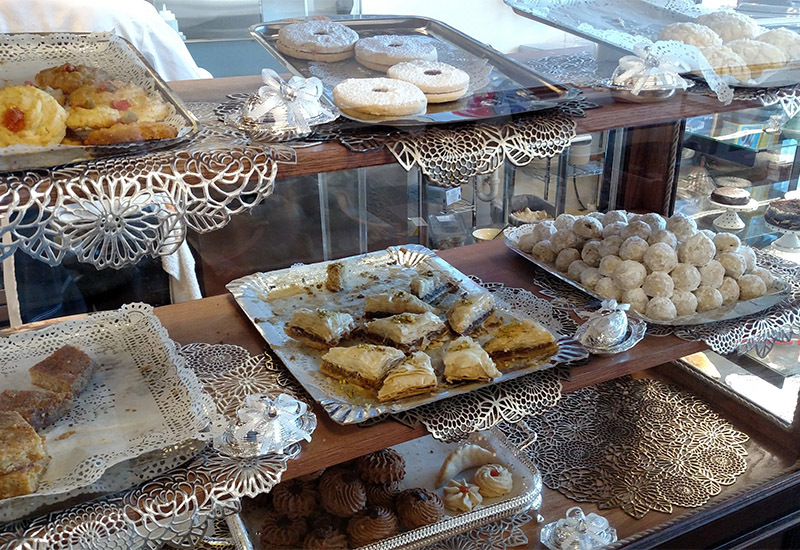 Speaking of cakes, Nile Café makes a variety of not only Mediterranean desserts such as baklava and knufa (also known as kanafeh), with regional fruits such as mangos and apricots, but they also have made-to-order cakes, with Hassan’s wife learning decorating in preparation for the store opening and designing wedding cakes. To go with dessert, Nile Café has a diverse selection of drinks from Turkish coffee to Moroccan tea to roselle, a minty lemon drink made with hibiscus. “Even our drinks are a little bit different,” Hassan said. We were lucky enough to get an invite to sample some of the dishes at Nile Café, ranging from their appetizers such as fresh hummus to entrées such as mousaka and some of their fresh cakes to go with it all. 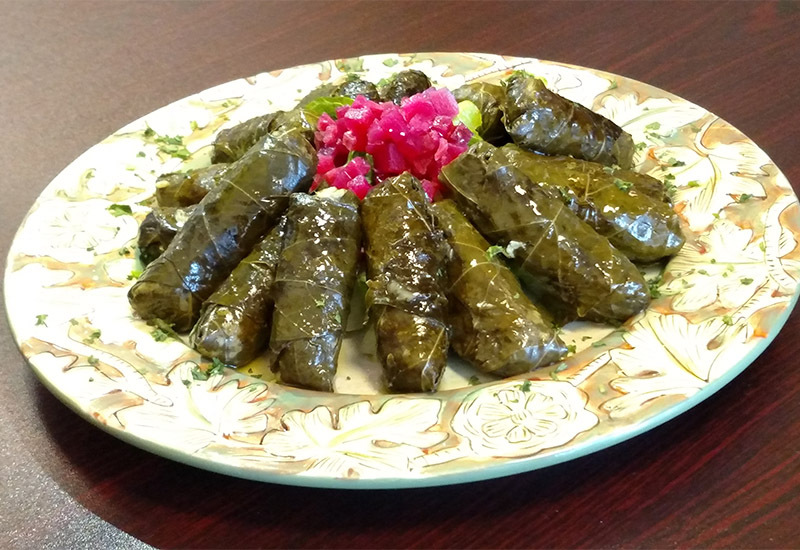 First up were Nile Café’s homemade grape leaves. The inside was filled with this thick, gooey rice that had a citrus flavor deep in there with what tasted like some herbs to balance it out. And on the coating of the grape leaf was enough olive oil to give a hit of that light sour taste. 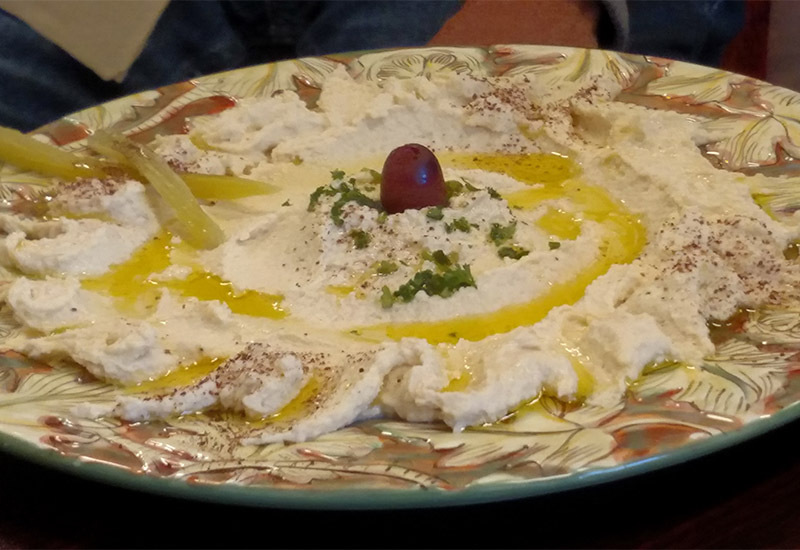 Then there was both hummus, which is made from chickpeas, and baba ghanouj, which is made from roasted eggplant. Their hummus had a mix of tangy and salty tastes while the baba ghanouj had a very crisp taste that was also bitter to give a cleansing feeling. To go with these, not only did Nile Café have fresh pita but they had an original side from Hassan he called “Nile Café Chips,” which was pita baked in olive oil and coated in spices. There was sesame sauce and hot sauce to dip these in. Next came some of Nile Café soups. I say some because the plan is for the soups to constantly rotate at the restaurant with three soups on at a time and shifting them around the menu. In Winer, Hassan said there will be six soups at a time. 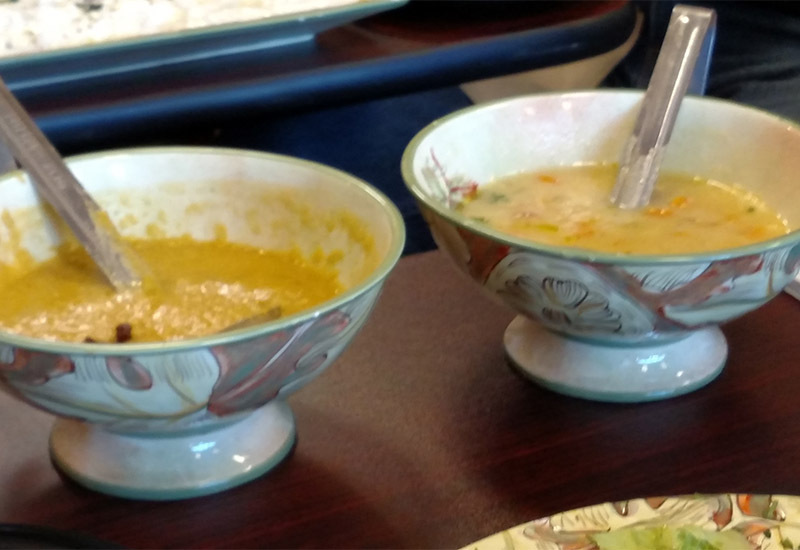 At the tasting event, there was a split pea lentil soup and avgolemono, a Greek lemon chicken soup. The lentil soup had this incredibly deep and savory taste with a strong hint of beans and lentils. To go with this particular soup, Hassan added fried onions on top, which he said was an authentic Egyptian style. This added a syrupy sweet note to the soup. The avgolemono was a mix of very different tastes. It had the light tart taste of the lemon with very delicate and warm chicken, plus the rice and other vegetables making it a sturdier soup overall. 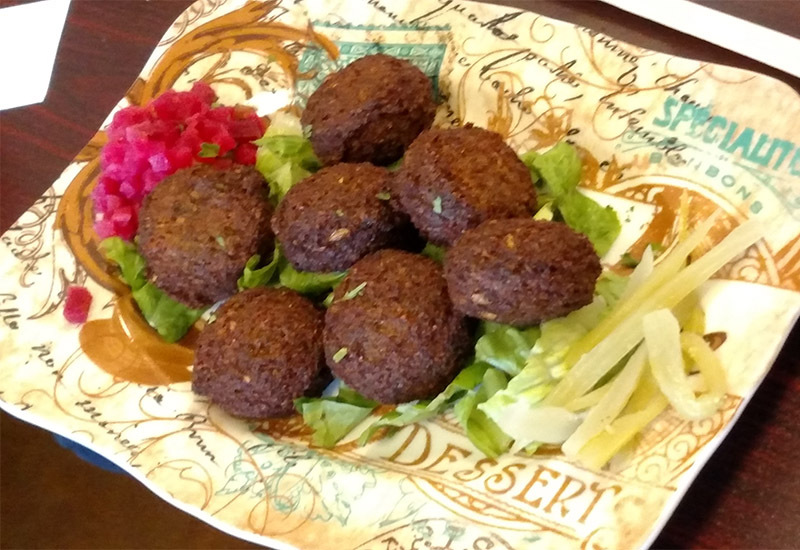 In between the soups and snacks and the heartier entrées came falafel, a deep-fried ball of lentils and fava beans, though Hassan said their use of fava beans was different than most restaurants. This did have a different taste from other falafels I’ve had and it was very hearty but also had a minty taste that made it easier to move onto the next course. Up first was what Hassan said was a quintessentially Egyptian dish: koshari. “It’s as common in Egypt as burgers are here,” he said. Koshari reflects the history of Egypt. It is a mix of British, Italian and Indian culinary traditions with North African/Mediterranean ingredients mixed in. Biting in, all of those influences came rushing out. Like Italian cooking, it was very hearty and had that strong tomato sauce taste. Its flavor was very similar to Indian cooking with many different spices and lentils working in tandem. And like British food, you could easily eat a lot in several goes. 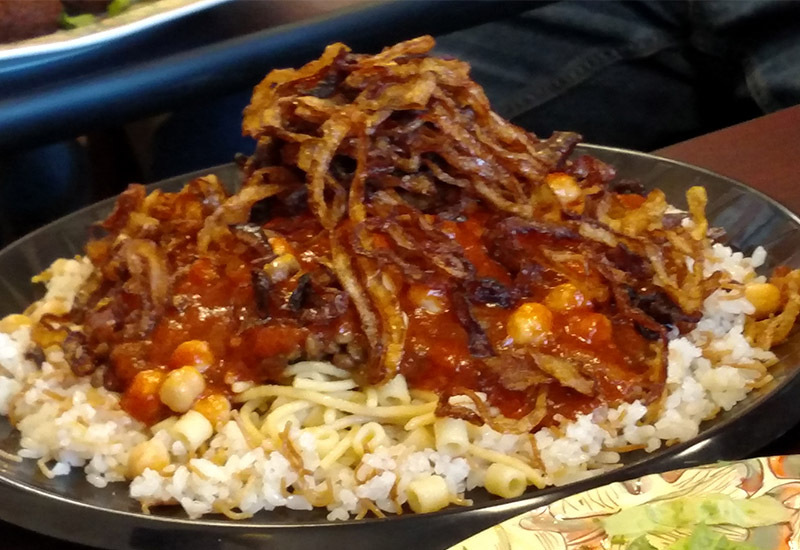 And like many of the dishes at Nile Café, the koshari is vegetarian so it’s something big and filling to try if you do not eat meat. Similar to the koshari‘s Italian influence, next was mousaka and penne bechamel. 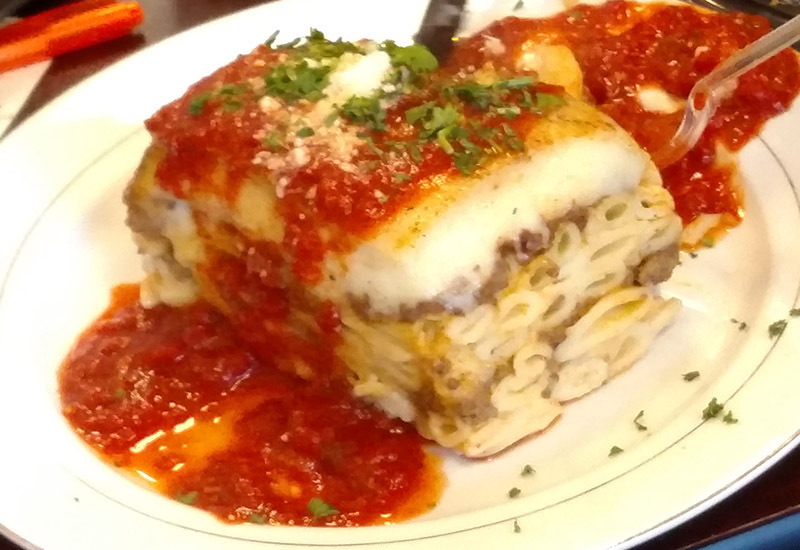 Mousaka has a very lasagna-like appearance, with potato, eggplant and minced beef all stacked together and tomato sauce over top. The penne bechamel is similar but with pasta inside instead. Both had a good, strong taste with very tender beef but there was also a slightly sweet, spiced taste to the filling that separated the layers, almost like a mild gingerbread. 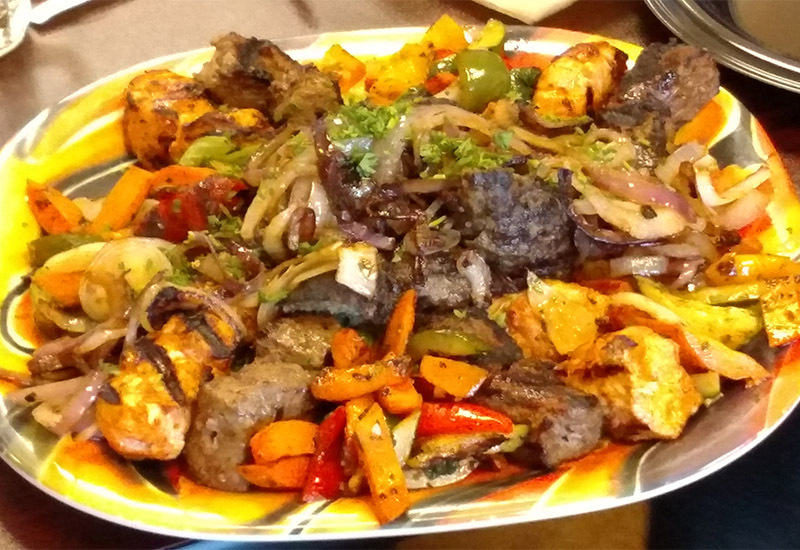 For a wide variety of tastes, there was the Queen of the Nile entrée, which comes with options of meat but in this case was chicken kebob and beef kufta, plus lots of crisp vegetables with vinegar and sautéed onion. The vegetables and the chicken were both very good, with the chicken in particular being surprisingly moist, but the beef was the highlight. With lentils mixed in, there was this penetrating spiced taste to it and it was cooked just right. On the children’s menu, Hassan said they are serving a burger with this exact kufta beef and I feel jealous of any kid who gets to try that. Finally came some of Nile Café’s freshly made desserts. 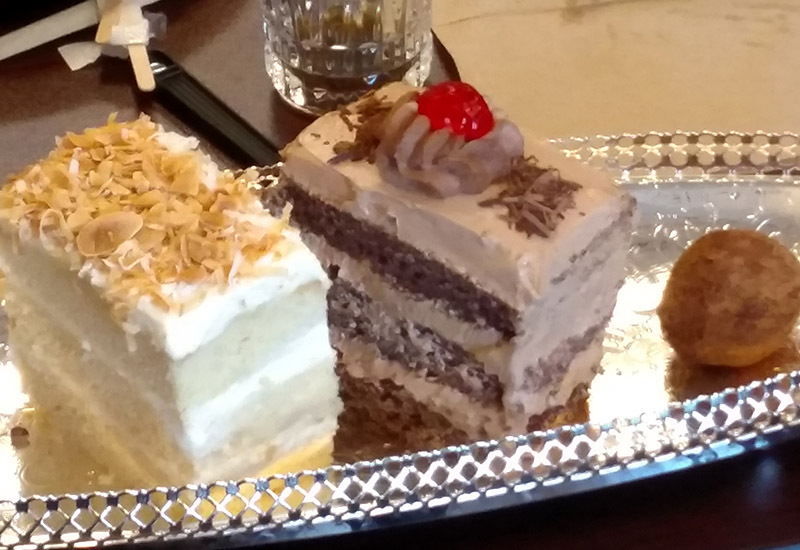 There was a coconut and a chocolate cake. The coconut had a very light, sweet pastry and its cream was extremely smooth and cool. The coconut shaving on top was very crunchy and had just enough of the coconut flavor to add to the cake without having any bitterness. The chocolate cake had a very spongey pastry with a deep, dark chocolate taste to the frosting. 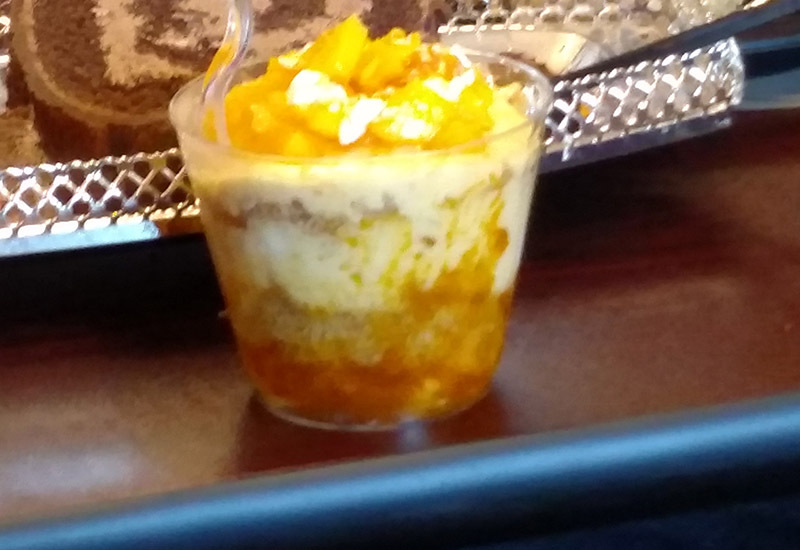 My last dish at Nile Café was a mango knufa, which was like a parfait but with knufa in the center. Knufa is a cheese-based pastry and it is both sweet and very crunchy, making a nice balance with the soft and fruity mango cream. 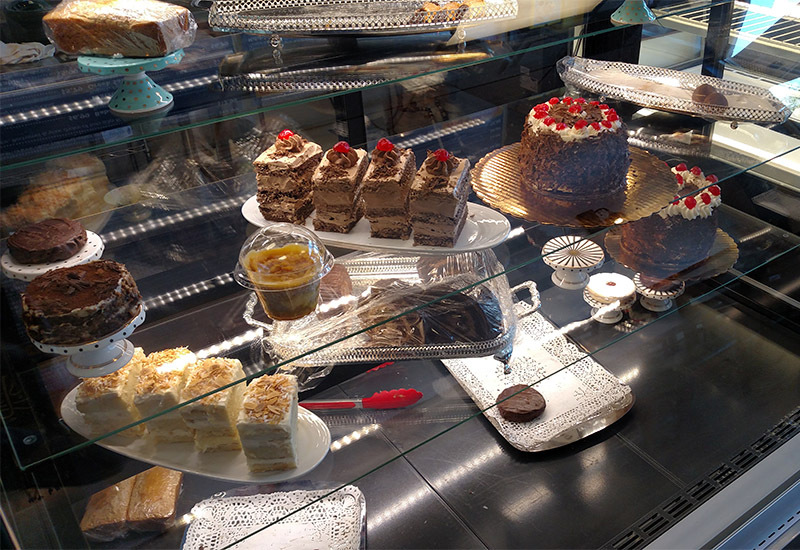 Nilé Cafe and Bakery is now open on 8204 Tryon Woods Dr. in Suite 111 in Cary.